Çildir Gölü is described in A Birdwatchers Guide to Turkey by Ian Green and Nigel Moorhouse as a good place to see both Great White Pelican Pelecanus onocrotalus and Dalmatian Pelican Pelecanus crispus. Through our friend Remco Hofland, we understood the nearby Aktas Gölü on the Georgian border was to be a much better place to see them, though. This surely turned out to be the case. As a good start, Aktas Gölü is much, much smaller and can be viewed in total at once. 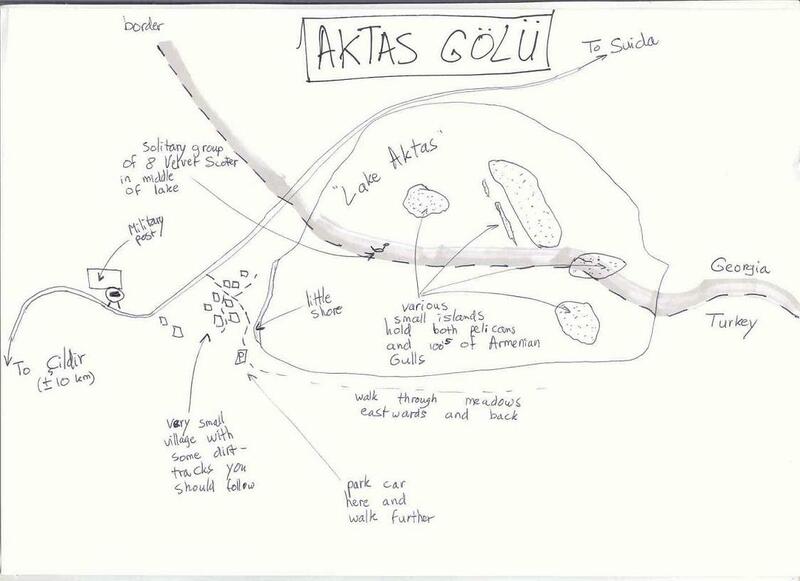 The diameter of Aktas Gölü is not more than a few kilometres. To reach Aktas Gölü, follow the road D010 from Ardahan eastwards in the direction of Çildir. After about 30 kilometres, turn north towards Çildir and drive along the main road through Çildir and directly out of it, northwards. After about 10 to 15 kilometres, you will see the lake on your right side. This is a truly impressive view, as you are standing way above the lake and you have a vast panorama over the lake and Georgia, which starts north of Aktas Gölü. The road up to this point is very much birding fun. We had our best views of Rufous-tailed Rock Thrush Monticola saxatilis along this road. On the west side of the lake, you will see a very small village. Drive towards this village. A very important matter is the following. As we drove towards this village, we passed a military control post, see the accompanying map below. We thought this was just one of the many military control posts present in this area. We waved at the soldier and he waved back friendly. On our way back a few hours later, we were stopped. A soldier present in the small village down the lake had seen us with a camera and alarmed the others at their post. They searched the car and started to make some trouble. Luckily, a boss of the soldiers, or something like that, turned out to be married to a German and spoke with us. Within five minutes, we drank tea with him along the road and we talked about birds, optics and Germany. So, for future visitors, we strongly advice to stop at the military post and ask for permission first. Most probably, militaries will not have a problem with your presence as long as you explain your purposes. On the map below, our most interesting observations are presented. After you have passed the military post, turned right onto the small dirt roads of the small village. Drive towards the shore. Here, we observed a few Little Egrets Egretta garzetta and Ruddy Shelduck Tadorna ferruginea. The first pelicans can we seen, but are very far away. Park your car and walk along the southern shore of the lake, eastwards, through the meadows. Here, you will surely see the nice Black-headed Wagtail Motacilla feldegg. You should walk as far as you want and as close as you want to get to the pelicans. We had nice views of about five Great White Pelican Pelecanus onocrotalus and 20 Dalmatian Pelican Pelecanus crispus flying above the lake and sitting on the small gravel islands. The distance to the birds is still considerable, though. On the middle of the lake, we observed a small and solitary group of eight Velvet Scoter Melanitta fusca, a species that can be seen on just a few high altitude lakes in eastern Turkey. After our visit to Aktas Gölü, we drove south towards Kars. By following the signs, we were automatically sent along the eastern side of Çildir Gölü. On this lake we hardly observed any specialities, let alone pelicans. This lake is immense and searching for pelicans must be a huge job. Hotels at Ardahan and Kars. Camping in the wild is dissuaded because of the many soldiers present; situation seems very tense here.